Last week we introduced Chip and Terminal, who have a lot to say about EMV, mainly because they are the main components in EMV technology. So we were lucky enough to be able to book a slot on their busy schedule this fall season to interview them and ask them a few questions. Personally, we think they’d be great on Bravo, but they might have competition with a real housewife or two. COCARD: Hi Chip. Hi Terminal. We’re so glad that we could ask you two a few questions about EMV. Really, we’re honored. Could you just start by telling us a little bit about yourselves? Chip: Sure, well I’m Chip, and I’m the small chip that’s embedded in credit cards with EMV technology. Banks have already started transitioning to cards including yours truly, and plan on having all cards in the US utilizing EMV technology within five years. Terminal: I’m Terminal, and all cards containing chips, will be dipped into terminals to be read. I like to say that I give new meaning to dipping the chip. I provide a one-time code to authenticate the card. Because of this, your data is protected, preventing a person from stealing a code that is only good for one transaction. COCARD: So when did you first realize that you worked so well together, that you were a great team? Terminal: I’ll take this one Chip. We’ve had a couple of countries really benefit from EMV technology. There’s the UK, which reduced fraud by more than half between 2004 and 2013 upon implementing EMV cards. Then there’s Canada, eh, that started the EMV roll-out in 2003 and reported fraud of $29.5 million (CAD), down 79% from 2009, which was $142 million (CAD). So I would say that it’s taken some time to see the effects, but in the past few years, we’ve really seen the impact that EMV cards have had in reducing fraud for many countries around the world. 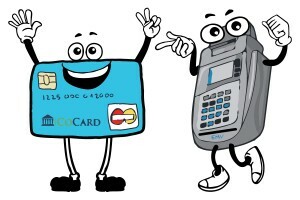 COCARD: EMV is new for many business owners. So I’m sure you understand how such a change might make people anxious. What would you say to assuage the fears of business owners everywhere? Chip: Well, first the sky is not falling. It might seem like it, but it’s not. The proof is that it’s already been successful in other places, and the US is simply one of the few developed nations that has not adopted this technology. EMV, through its authentication process, is really what makes these cards, our cards, more secure. So they are a safe and secure way to pay for things. We think that any business owner can appreciate the feeling of comfort that security brings. The big thing for business owners to remember is that banks have a five year plan and that only 21% of US cards will have the embedded chip by the October 1st liability shift..
COCARD: Anything else you’d like business owners out there to know? Terminal: We just want you all to stay informed. Keep learning. The more you know, we think the less you’ll feel out of your element with something that can benefit your business. COCARD: Thanks Chip. Thanks Terminal. You were both great. We appreciate that you were able to take time out of your busy schedules—you two are in high demand—to spend a few minutes with us at COCARD. Have a great day.